Peri-implant mucositis and peri-implantitis are diseases that affect the tissues surrounding a functional implant. Poor oral hygiene, smoking and previous history of periodontitis are known risk factors for the disease. The probing depth, the presence of bleeding on probing, suppuration and radiographs should be assessed regularly for the diagnosis else it can lead to implant loss and impaired function. In addition, the extent of the disease and pattern of bone loss are poorly described. 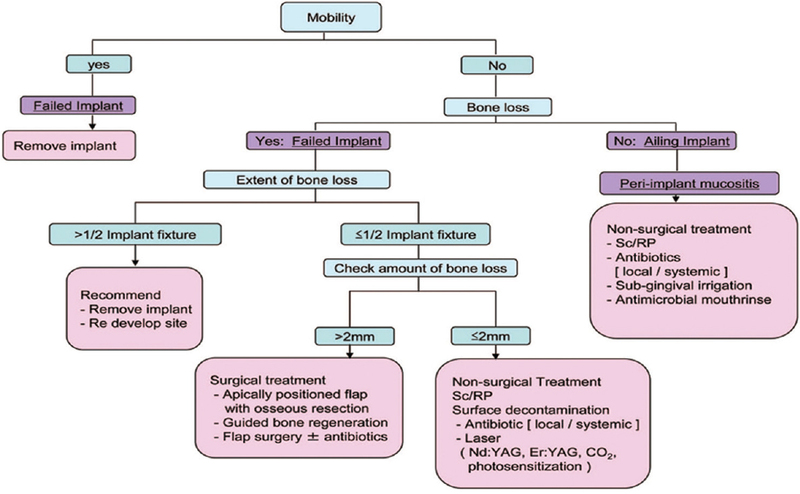 There is limited information regarding the management of peri-implantitis. Various treatment modalities have been tried and tested, but there is yet to be a predictable outcome for peri-implantitis. Health care is being changed dramatically by the marriage of computers and telecommunications. Implications for hospitals and physicians already have received extensive media attention, but comparatively little has been said about the impact of information technology on dentistry. Teledentistry is the use of information technology and telecommunications for dental care, consultation, education, and public awareness. 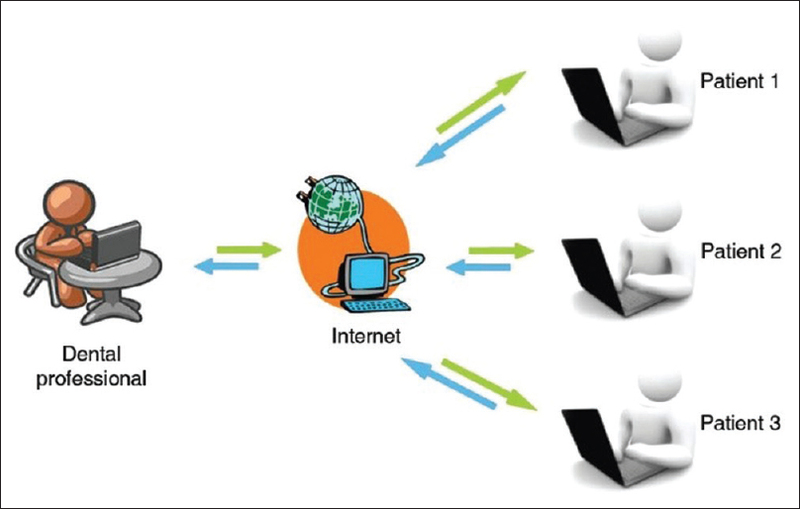 This article reviews the origin, rationale, scope, basis, and requirements for teledentistry, along with the current evidence that exists in the literature and illustrates how the digital transformation will likely affect dentists and their patients. For ethical reason, initiation and progression of periodontal disease as well as certain types of periodontal treatment cannot be studied in humans. Instead, numerous studies in this field have been carried out in laboratory animals. Animal models are needed to objectively evaluate the pathogenesis of human periodontal disease and its various treatment modalities. A number of animal models have been used in studying etiology and pathology of periodontitis. The primate model is recommended because the pathogenesis in primate model closely resembles that in humans. In addition, the dog model is used frequently because of ease of ligature placement as well as the natural occurrence of periodontal disease. However, ease of handling, inexpensive, short study time, low variation among strains and controlled microflora, relatively disease resistant, make the rat model extremely versatile and suited for a wide range of research endeavors. 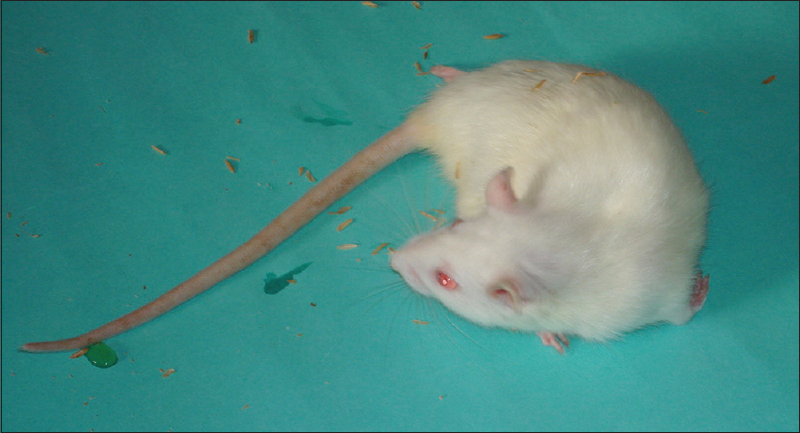 Rats are used mainly for research in toxicity, nutrition, behavior, and cancer. Normal oral structure and physiology and the pathogenesis of periodontal diseases have been studied more extensively in the rat than in any other rodents. Rats are used extensively to study the effects of drugs on the gingiva because their tissue overgrowth is similar to that of humans. The purpose of this review is to evaluate rats as models for studying various aspects of periodontal disease, including disease process and its treatment handling, advantages and limitations of these models. Objective: This institutional study was sought to determine the relative frequency of odontogenic tumors (OTs) in a western Uttar Pradesh population and to compare these data with previous reports. Study Design: In this retrospective study, all the accessioned cases were retrieved from the histopathology records of Subharti Dental College and Hospital between January 2003 and December 2015. Lesions with histological diagnosis of OTs (based on the World Health Organization classification, 2005) were analyzed. Clinical data were reviewed, and microscopic diagnoses were confirmed for cases in which diagnoses were ambiguous. The relative incidence of each tumor type, patient age, gender, and site of occurrence are compared with similar reports from other selected large series. Results: From a total of 3182 oral biopsies accessioned during 13-year interval, 255 lesions were diagnosed histopathologically as OTs, which constituted 8.01% of all the oral biopsies. Of these cases, 98.43% of the tumors were benign. The most frequent histological type was keratinizing cystic OTs (41.96%), followed by ameloblastoma (34.50%) and while odontomas, generally regarded as the most frequent OT in many large series, only accounted for 7.45%, the third most common tumor in the present study. In general, the OTs showed a predilection for the mandible and the posterior regions of the jaws. Males outnumbered females for benign tumors while the reverse was true for malignant tumors. Conclusions: OTs show a definite geographic variation. In western Uttar Pradesh population in India, the most frequent OTs had a comparatively younger age predilection. Aim: The aim of this study is to determine the prevalence of apical periodontitis (AP) in root canal-treated teeth in females in Qassim region, Saudi Arabia and to evaluate the correlation of quality of the root canal fillings, coronal restorations (CRs), and cast restorations with the AP. Study Design: Cross-sectional retrospective study. Place and Duration: Female Dental Clinics at College of Dentistry at Qassim University, Saudi Arabia from January 2014 to February 2017. Materials and Methods: A total of 400 orthopantomograms were evaluated out of which root canal treatment (RCT) had been performed in 1108 teeth. Frequencies and percentages of quality of RCT, CR, and periapical status were recorded. Their association was recorded by Chi-square test and Pearson correlation was computed at significance level of 5%. Results: A total of 813 (73.4%) endodontically treated teeth presented with AP radiographically. The percentages of teeth which fulfilled the criteria of an acceptable RCT, CR, and cast restoration radiographically were 8.8%, 64%, and 93.6%, respectively. The incidence of AP among teeth with acceptable RCT (35.1%) was significantly lower than those with unacceptable RCT (77.1%) (P < 0.001). Moreover, adequate CR demonstrated a significantly better periapical status (60.2%) compared to teeth with inadequate CR (95%) (P < 0.001). The incidence of AP ranged from 24.1% (in acceptable RCT and CR cases) to 96.6% (in unacceptable RCT and CR cases) (P < 0.001). Adequate cast restoration demonstrated a better periapical status (76%) compared to teeth with inadequate cast restoration (87.5%). The incidence of AP ranged from 15.6% (in acceptable RCT and cast restoration cases) to 86.7% (in unacceptable RCT and cast restorations cases) (P < 0.001). Pearson correlation coefficient was computed. Length of obturation, density of root filling, quality of CR and quality of cast restoration were found to have highly significant positive correlation with AP (r = −0.375, r = −0.162, r = −0.118, r = −0.079, respectively). Conclusion: The prevalence of AP has been found 73.4% in root treated teeth. Quality of RCT, CR, and of cast restoration is significantly associated with periapical status in root-filled teeth. Introduction: The main goal of endodontic therapy is the complete removal of the pulpal tissues and bacteria within the pulp space to provide an adequate space for three dimensional root canal filling, resulting in a positive environment for the regeneration of periapical tissues. Infections of endodontic origin are treated mainly by means of mechanical procedures aided by chemical substances, of which sodium hypochlorite (NaOCl) is the most commonly used. Different irrigation regimens have been proposed to enhance the effectiveness of NaOCl in disinfecting the root canal system, the use of ultrasonics being one among them. Based on these premises, the purpose of the study is to compare the efficacy of two different irrigation methods in reducing the bacterial count within the root canal. Objective of the Study: The aim of this study is to compare the efficacy of syringe-needle irrigation to passive ultrasonic agitation in reducing the bacterial count of three endodontic pathogens within the root canal. Methodology: The study was conducted on 50 extracted human teeth. Teeth were decoronated and the apices were sealed with autopolymerizing resin. The teeth were then inoculated and incubated with a suspension comprising equal amount of three endodontic pathogens: Streptococcus mutans, Candida albicans, and Enterococcus faecalis (E. faecalis). The canal preparations were done using crown down technique and samples were divided into two groups based on irrigation technique: Group 1; Syringe-needle irrigation and Group 2; Additional ultrasonic agitation of irrigant (2.5% NaOCl). The root canals were sampled after the procedure and the samples were inoculated on the respective selective growth media and the colony-forming units (CFUs) were calculated. The statistical analysis used was Student's unpaired t-test for intergroup comparison and one-way ANOVA and Tukey's post hoc test for intragroup comparison. Results: The Group 2 (ultrasonic agitation) showed highly statistically significant lower CFUs when compared to Group 1 (syringe-needle irrigation). E. faecalis proved to be the most resistant microorganisms of the three used in the study. Conclusion: Within the limits of the study, ultrasonic agitation of an irrigant proves to be a promising option to achieve significant bacterial reduction and thus achieves reliable and predictable endodontic success. Aim: The aim of this study is to assess canine tooth impaction (TI) among population of Riyadh, Saudi Arabia. Subjects and Methods: We performed a retrospective analysis of 2157 patients' panoramic radiographs who visited any of the three campuses of Riyadh Colleges of Dentistry and Pharmacy clinics between August 2014 and May 2015. Analysis was performed specifically for the purpose of this study. 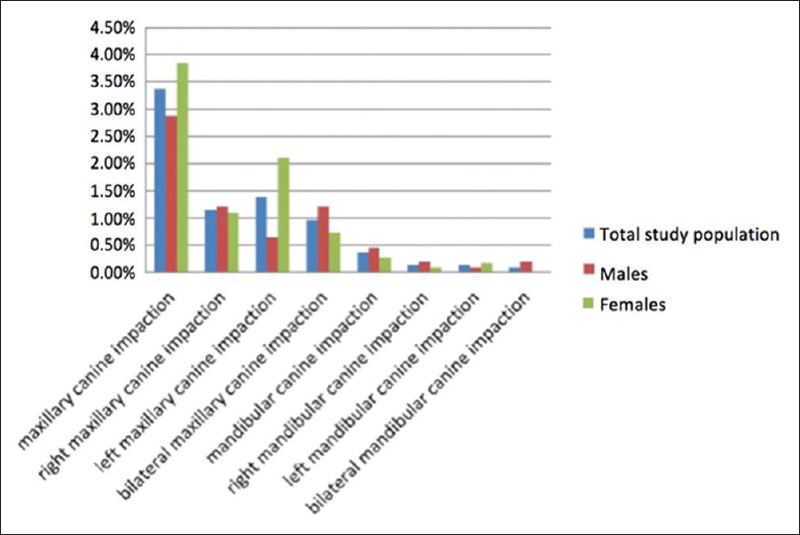 Results: Among the 2157 panoramic radiographs analyzed, we found canine impaction in 79 patients (3.65% of the total sample size). Seventy-three cases had maxillary canine impaction (3.37% of the total population) and eight patients with mandibular canine impaction. Conclusions: Higher than the reported figures, in this large cohort of Riyadh population reviewed, canine TI is 3.6%. Aim: Dental caries is one of the most common chronic dental diseases of childhood. 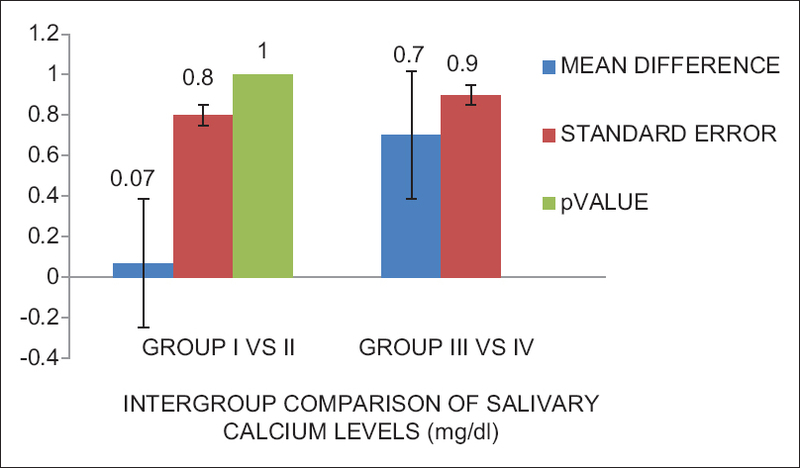 Saliva by virtue of its chemical composition provides the main host defence in the oral cavity and plays an essential role in maintaining the integrity of oral structure. The present study was an attempt to correlate the changes in biochemical parameters with dental caries in the saliva samples of children of two different age groups. Materials and Methods: The level of calcium, phosphorous, α-amylase, and pH was measured in the saliva of caries-free (control group with decayed, missing, and filled teeth [DMFT] = 0) and caries-affected (test group with DMFT ≥5) children of 3–8 years and 9–14 years of age. 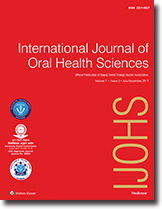 Results: Statistical analysis of the data thus obtained revealed no significant difference in the mean values of calcium, phosphorus, α-amylase, and pH in caries-affected children when compared to their age-matched control group except phosphorous which increased significantly in caries-affected children of 3–8 years of age. There was also a significant correlation between calcium and phosphorous levels (r = 0.192*, P = 0.04) irrespective of age group. Conclusions: This study indicated a direct relationship between phosphorous level and dental caries in children of younger age group (3–8 years of age) and was attributed to their greater susceptibility to dental caries leading to their more DMFT status than children of 9–14 years of age. Greater susceptibility of primary enamel to demineralization is well documented in the literature, and it is because of its less mineralized, significantly softer and less elastic nature and higher organic content that dissolves faster in the acidic environment than the permanent enamel. Increased phosphorus in the saliva sample of caries-affected children might be due to the hydrolysis of organic phosphates of their enamel. Significant correlation between calcium and phosphorous supports the involvement of these two minerals in the formation of hydroxyapatite of tooth. In general dental practice, a dentist may come across various pigmented lesions in oral cavity. In most cases, the lesions are asymptomatic and benign in nature. 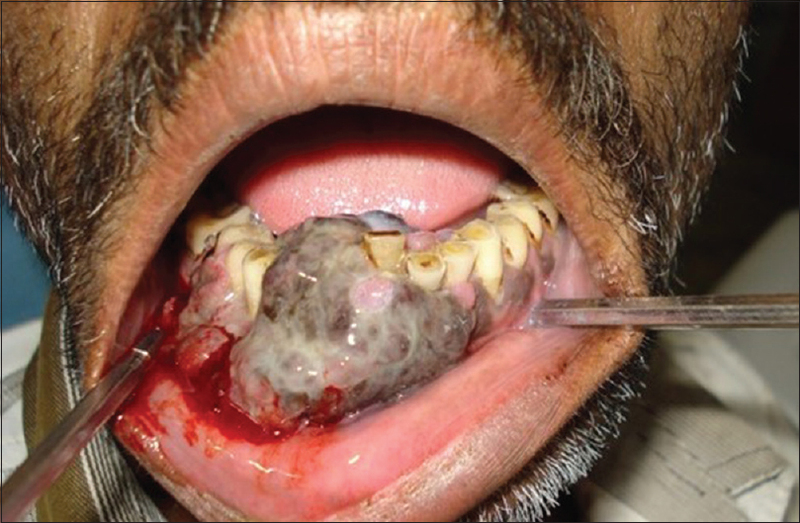 However, rarely, a pigmented lesion can be a sign of malignancy. 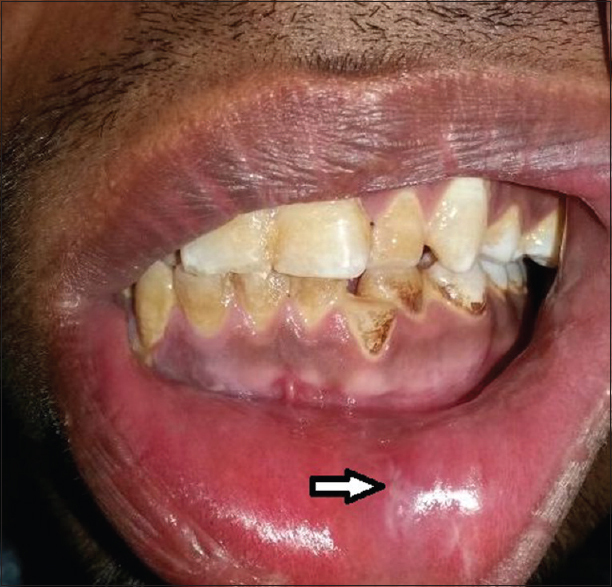 We report a case of a pigmented lesion in mandibular gingiva to highlight the importance of biopsy for early diagnosis and prolonged survival of patients. Trauma to maxillofacial region usually leads to damage to teeth and supporting structures. Damage to teeth can occur in isolation or with soft tissue and sometimes may even involve bone. Facial trauma may cause dental fragment embedded in surrounding tissue and that may go unnoticed if not properly examined. 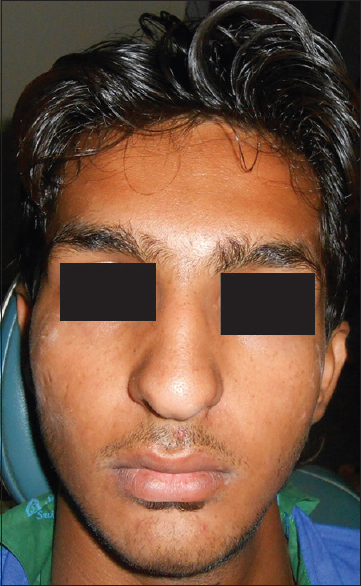 Here, we report a case of lip swelling and tenderness caused due to an embedded tooth fragment. The tooth fragment got impacted in the lower lip due to facial trauma 5 months back. Diagnosis was based on clinical history and conventional radiograph. The tooth fragment was successfully removed without any complication. Van der Woude syndrome (VWS) is a rare autosomal dominant condition typically comprising the cleft lip or cleft palate and pits of the lower lips. The degree to which individuals carrying the gene are affected varies widely, even within families. The variable manifestations include lip pits alone, absent teeth, and isolated cleft lip and palate of varying degrees of severity, bifid uvula, ankyloglossia, and enamel hypoplasia. We report a case of VWS manifesting with bifid uvula, hypodontia, ankyloglossia, and enamel hypoplasia. Tuberculosis is the leading cause of death worldwide with India leading the count (World Health Organization report 2016). 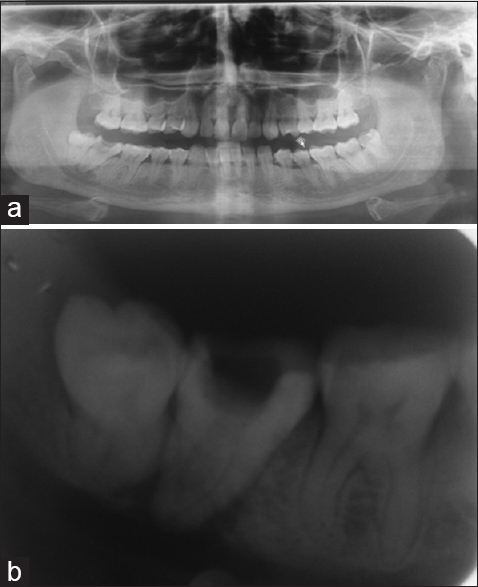 We present a case of right submandibular swelling and tuberculous periapical granuloma associated with carious mandibular 2nd molar adjacent to partially impacted third molar in a 35-year-old female patient. Histopathology report of periapical specimen revealed tuberculous granulomatous pathology that correlated with the histopathology report of submandibular lymph node on the same side of face. The lesion healed uneventfully with expert medical consultation. The patient was followed up for 13 months.